Yeomans FE, Clarkin JF, Altschul, E, Hull JW. The Role of Figurative Language in the Induction Phase of an Expressive Psychotherapy. Journal of Psychotherapy Research and Practice Summer 1992; l(3), 270-279. Borderline Patient. Hospital and Community Psychiatry April 1993; 44(4), 334-336. Yeomans FE, Selzer MA, Clarkin JF. Studying the Treatment Contract in Intensive Psychotherapy with Borderline Patients. Psychiatry August 1993; 56(3), 254-269. Sexual Behavior. Hospital and Community Psychiatry October 1993; 44(l0), l000-l002. Yeomans FE, Hull JW, Clarkin JF. Risk Factors for Self‑Damaging Acts in a Borderline Population. Journal of Personality Disorders 1994; 8(1), 10-16. Clarkin JF, Hull JW, Yeomans FE, Kakum T, Canton J. Antisocial Traits as Modifiers of Treatment Response in Borderline Inpatients. Journal of Psychotherapy Practice and Research Fall 1994; 3(4), 307-312. Yeomans FE, Gutfreund J, Selzer MA, Clarkin JF, Hull JW, Smith TE. Factors Related to Borderline Drop-Outs: Treatment Contract and Therapeutic Alliance. Journal of Psychotherapy Practice and Research Winter 1994; 3(l), 16-24. Smith TE, Koenigsberg HW, Yeomans FE, Clarkin JF, Selzer MA. Predictors of dropout in psychodynamic psychotherapy of borderline personality disorder. Journal of Psychotherapy Practice and Research 4 1995; 205-213. Hull J, Yeomans FE, Clarkin JF, Li C, Goodman G. Factors associated with multiple hospitalizations in borderline inpatients. Psychiatric Services, 47 1996; 638-641. Goodman G, Hull JW, Clarkin JF, Yeomans FE. Comorbid mood disorders as modifiers of treatment response among inpatients with borderline personality disorder. Journal of Nervous and Mental Disease 1998; 186(10), 616-622. Diamond D, Clarkin JF, Levine H, Levy K, Foelsch P, Yeomans FE. Borderline conditions and attachment: A preliminary report. Psychoanalytic Inquiry 1999;19. Goodman G, Hull JW, Clarkin JF, Yeomans FE. Childhood antisocial behaviors as predictors of psychotic symptoms and DSM-III-R borderline criteria among inpatients with borderline personality disorder. Journal of Personality Disorders 1999; 13(1), 35-46. Yeomans FE, Clarkin JF. New developments in the investigation of psychodynamic psychotherapy. Current Opinion in Psychiatry 2001;14, 591-595. Yeomans FE, Levy KN. An Object Relations Perspective on Borderline Personality. Acta Neuropsychiatrica 2002; 14, 76-80. Yeomans FE. Transference-focused Psychotherapy in Borderline Personality Disorders. Psychiatric Annals 2004;34(6), 449-454. Levy KL, Clarkin JF, Yeomans FE, Scott LN, Wasserman RH, Kernberg OF. The Mechanisms of Change in the Treatment of Borderline Personality Disorder with Transference Focused Psychotherapy. Journal of Clinical Psychology 2006; 62(4), 481-502. Yeomans FE, Delaney JC, Renaud A. La psychothérapie focalisée sur le transfert. Santé Mentale au Québec 2007;XXXII(1), 17-34. Clarkin JF, Yeomans FE, Lenzenweger MF, Levy KL, Kernberg OF. An Object Relations Model of Borderline Pathology. Journal of Personality Disorders 2007; 21(5): 474-499. Levy KN, Yeomans FE, Diamond D. Psychodynamic treatments of self-injury, Journal of Clinical Psychology 2007; 63(112): 1165-1120. Yeomans FE, Questions Concerning the Randomized Trial of Schema-Focused Therapy vs Transference-Focused Psychotherapy. Letter to the Editor, Archives of General Psychiatry 2007; 64, 609-610. Yeomans FE, Delaney J. Transference-Focused Psychotherapy as a Means to Change the Personality Structure that Underlies Borderline Personality Disorder. Social Work in Mental Health 2008; 6(1/2): 157-170.
l’attachement et le fonctionnement réflexif. Santé Mentale au Québec 2008; 33(1): 61-87. Diamond D, Yeomans FE. Le rôle de la TFP dans le traitement des troubles narcissiques. Santé Mentale au Québec 2008; 33(1): 115-139. Delaney, J.C., Yeomans, F.E., Stone, M.,& Haran, C. (2008) Incidence de certains facteurs sur l'issue d'une psychotherapie dans un essai clinique randomise aupres de patients avec trouble de personnalite limite. Sante Mentale au Québec, XXXIII, 1, 15-36. Lenzenweger MF, Clarkin JF, Yeomans FE, Kernberg OF, Levy KN. Refining the Borderline Personality Disorder Phenotype through Finite Mixture Modeling: Implications for Classification. Journal of Personality Disorders 2008; 22(4): 313-331. 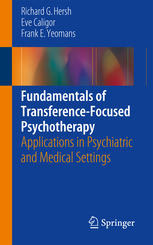 Kernberg OF, Yeomans FE, Clarkin JF, Levy KN: Transference Focused Psychotherapy: Overview and Update. International Journal of Psychoanalysis 2008; 89: 601-620. Psychoanalytic Psychotherapy of Borderline Personality Pathology. Journal of the American Psychoanalytic Association 2009; 57: 271-301. Commenting on Tyrer and Paris, et al. Journal of Personality and Mental Health 2009; 3: 110-115. Levy KN, Yeomans FE, Denning F, Fertuck EA. UK National Institute for Clinical Excellence guidelines for the treatment of borderline personality disorder. Personality and Mental Health 2010; 4(1): 54-58. Yeomans F.E. & Diamond D. (2010). Treatment of Cluster B Disorders: TFP and BPD. Eds: Clarkin JF, Fonagy P, & Gabbard GO. Psychodynamic Psychotherapy for Personality Disorders: A Clinical Handbook. German edition, Eds Dulz, Herpertz/Kernberg/Sachsse. Handbook of Borderline Personality Disorder, 2nd edition. Washington DC: American Psychiatric Publishing (pp. 209-239). Yeomans FE. Commentary on Elsa Ronningstam’s ‘Narcissistic Personality Disorder’. Personality and Mental Health 2011; 5: 238-242. Caligor E., Diamond D., Yeomans F., Kernberg O.F. (2011). Le molteplici funzioni del processo interpretativo nella TFP. In J.F. Clarkin, F. Yeomans, O. Kernberg. Psicoterapia psicodinamica dei disturbi di personalità: un approccio basato sulle relazioni oggettuali. Manuale della Psicoterapia Focalizzata sul Transfert (TFP). (pp. 389-411). Rome: Giovanni Fioriti Editore. Diamond D, Yeomans FE, and Levy K. (2011) Psychodynamic Psychotherapy for Narcissistic Personality Disorder. In K. Campbell and J. Miller (Eds), The Handbook of Narcissism and Narcissistic Personality Disorder: Theoretical Approaches, Empirical Findings, and Treatment, (pp. 423-433). New York: Wiley. Diamond D., Yeomans F.E., Levy K.N., (2011). Psicoterapia psicodinamica delle personalità narcisistiche. In J.F. Clarkin, F. Yeomans, O. Kernberg. Psicoterapia psicodinamica dei disturbi di personalità: un approccio basato sulle relazioni oggettuali. Manuale della Psicoterapia Focalizzata sul Transfert (TFP). (pp. 412-426). Giovanni Fioriti Editore, Rome. Stern BL, Yeomans FE, Diamond D, & Kernberg OF. (2011) Transference-Focused Psychotherapy (TFP) for Narcissistic Personality Disorder. In, Understanding and Treating Narcissistic Personality Disorder (pp. 235 - 252). J. S. Ogrodniczuk, (Ed.). Washington D.C.: American Psychiatric Press. Carsky M & Yeomans FE. Overwhelming Patients and Overwhelmed Therapists. Psychodynamic Psychotherapy 2012; 40 (1): 75-90. In: Journal of the American Academy of Psychoanalysis issue guest edited by Michael Stone. Diamond, D., Yeomans, F.E., Levy, K.N., Hörz, S., & Clarkin, J. (2012). Transference focused psychotherapy for patients with co-morbid narcissistic and borderline personality disorder: The contributions of research to therapy. Personality Disorders: Theory, Research, and Treatment. Lenzenweger MF, Clarkin JF, Levy KN, Yeomans FE, & Kernberg OF. (2012). Predicting domains and rates of change in borderline personality disorder. Personality Disorders: Theory, Research, and Treatment, 3 185-195. Diamond D, Yeomans FE, Stern B, Levy K, Hörz S, Fischer-Kern M, Delaney J, Clarkin J., Transference Focused Psychotherapy for Patients with Co-Morbid Narcissistic and Borderline Personality Disorder. Psychoanalytic Inquiry, 2013, 33:6. Diamond, D., Yeomans, F.E., Stern, B.S., Levy, K.N., Hörz, S., & Delaney, J.C. (2013). Transference-Focused Psychotherapy for patients with comorbid narcissistic and borderline personality disorder. Psychoanalytic Inquiry, 33(6), 527-551. Yeomans, F. E., Levy, K. N., Meehan, K. B. (in press). Treatment approaches for borderline personality disorder. The Psychiatric Times. Yeomans, F. E., Clarkin, J. F., & Levy, K. N. (in press). Psychodynamic psychotherapies. In J. Oldham, A. Skodol, & D. Bender (Eds.) The American Psychiatric Publishing Textbook of Personality Disorders (pp. 275-287). Arlington, VA: American Psychiatric Publishing. Yeomans, F. E., & Levy, K. N. (in press). Transference focused psychotherapy. In J. Reich, & D. P. Bernstein (Eds.) Evidence-based treatments for personality disorders: State-of-art treatments for difficult patients. Yeomans FE. Freud et le yiddish; le préanalytique. Psychoanalytic Quarterly 1984; 53:4, 612-614 [review]. Yeomans FE. The Legend of Freud. Psychoanalytic Quarterly1985; 54:1, 120-123 [review]. Yeomans FE. Interpreting Lacan. Psychoanalytic Quarterly 1986; 55:4, 649-652 [review]. Yeomans FE. Jacques Lacan: The Death of an Intellectual Hero. Psycho­analytic Quarterly 1987; 56:2, 377-380 [review]. Yeomans FE. Psychotherapy of Neurotic Character. Journal of Clinical Psychiatry 1991; 52:l, 46 [review]. Yeomans FE, Selzer MA, Clarkin JF. Treating the Borderline Patient: A Contract-Based Approach. Basic Books, New York; 1992. Clarkin JF, Koenigsberg H, Yeomans FE, Selzer MA, Kernberg P, Kernberg OF. "Psychodynamic Psychotherapy of the Borderline Patient," in Borderline Personality Disorder: Clinical and Empirical Perspectives, Eds. Clarkin JF, Marziali E, Munroe-Blum H, Guilford Publications, New York; 1992. Yeomans FE. Borderline Personality Disorder: A Multidimensional Approach. General Hospital Psychiatry 1996; 18 [review]. Clarkin JF, Yeomans FE, Kernberg OF. Psychotherapy for Borderline Personality. John Wiley and Sons, New York; 1999. Koenigsberg H, Kernberg OF, Stone M, Appelbaum A, Yeomans FE, Diamond D. Borderline Patients: Extending the Limits of Treatability. Basic Books, New York; 2000. Yeomans FE, Clarkin JC, Kernberg OF. 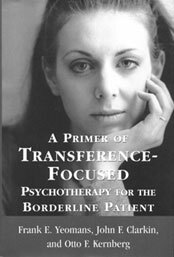 A Primer on Transference-Focused Psychotherapy for Borderline Patients. Jason Aronson, Northvale, NJ; 2002. Yeomans FE, Clarkin JF, Levy KL. "Psychodynamic Psychotherapies" in Textbook of Personality Disorders, Eds. Oldham J, Skodol A, Bender D. American Psychiatric Press, Washington, DC; 2005. pp. 275-288. Clarkin JF, Yeomans FE, Kernberg OF. Psychotherapy for Borderline Personality: Focusing on Object Relations. American Psychiatric Press, Washington, DC; 2006. Diamond D, Yeomans FE. "Oedipal Love and Conflict in the Transference-Countertransference Matrix: It’s Impact on Attachment Security and Mentalization" in Attachment and Sexuality, Eds. Diamond D, Blatt S, Lichtenberg J. The Analytic Press, New York; 2007. (pp. 201-255). Dammann G, Clarkin JF, Yeomans FE, Kernberg OF. "Die űbertragungsfokussierte Psychotherapie TFP – Ein störungs-spezifisches, manualgeleitetes psychodynamisches Verfahren zur Behandlung der Borderline-Persönlichkeitsstörung" in Psychotherapie der Borderline-Störungen, Eds. Dammann G, Janssen PL. Thieme, Stuttgart; 2007. Kernberg OF, Diamond D, Yeomans FE, Clarkin JF, and Levy KN: "Mentalization and Attachment in Borderline Patients in Transference-focused Psychotherapy" in Mind to Mind: Infant Research, Neuroscience and Psychoanalysis, Eds. Jurist E, Slade A, Bergner S. Other Press, New York; 2008. 167-201. Yeomans FE, Clarkin JC, Diamond D, Levy KL: "An Object Relations Treatment of Borderline Patients with Reflective Functioning as a Mechanism of Change" in Mentalization: Theoretical Considerations, Research Findings, and Clinical Applications, Ed. Busch F. The Analytic Press, New York, 2008. 159-181. Diamond D, Yeomans FE, Clarkin, J, Levy K., Kernberg, OF. "The Reciprocal Impact of Attachment and Transference-Focused Psychotherapy with Borderline Patients" in Clinical Applications of the Adult Attachment Interview, Eds. Steele, H and Steele, M. New York: Guilford Press; 2008. 270-294. (pp. 339-385). Levy KN, Wasserman RH, Scott LN, Yeomans FE. Empirical evidence for transference focused psychotherapy and other psychodynamic psychotherapy for borderline personality disorder in Handbook of Evidence-Based Psychodynamic Psychotherapy: Bridging the Gap between Science and Practice,Eds. Ablon S, Levy R . New York: Humana Press; 2009. (pp. 93-119). Yeomans FE, Diamond D. "Treatment of Cluster B Disorders: Transference-Focused Psychotherapy and Borderline Personality Disorder" in Psychodynamic Psychotherapy for Personality Disorders: A Clinic Handbook, Eds. Clarkin JF, Fonagy P, Gabbard GO. Washington, DC: American Psychiatric Publishing; 2010. Caligor E, Yeomans FE, Levin, Z. "Personality Disorders" in Psychiatry, Eds. Cutler, JL, Marcus, ER. Oxford University Press; 2010. pp. 264-299. Levy KN, Meehan KB, Yeomans FE. Transference-focused psychotherapy reduces treatment drop-out and suicide attempters compared with community psychotherapist treatment in borderline personality disorder. Evidence Based Mental Health published online August 10, 2010. BMJ Publishing Group Ltd. Royal College of Psychiatrists and British Psychological Society. Diamond D, Yeomans FE, and Levy K. Psychodynamic Psychotherapy for Narcissistic Personality Disorder. The Handbook of Narcissism and Narcissistic Personality Disorder: Theoretical Approaches, Empirical Findings, and Treatment, Eds. Keith Campbell and Josh Miller, New York: Wiley; 2011. Yeomans, F.E. & Diamond, D. (2011). Ubertragungsfokussierte Psychotherapie (Tansference-focused Psychotherapy, TFP) und Borderline-Personlichkeitssorung. Handbuch der Borderline-Storungen. Eds B. Dulz, S.C. Herpertz, O. Kernberg, U. Sachsse. Handbook of Borderline Personality Disorder Stuttgart, Germany: Schattauer. Clarkin JF, Yeomans FE. Managing Negative Reactions to Clients with Borderline Personality Disorder in Transference-Focused Psychotherapy. Transforming Negative Reactions to Clients, Eds. Abraham Wolf, Marvin Goldfried and J. Christopher Muran, Washington: American Psychological Association; 2012. Levy KN, Meehan KB, Temes CM, & Yeomans FE. Attachment theory and research: Implications for psychodynamic psychotherapy. In R. Levy & S. Ablon (Eds. ), Handbook of Evidence Based Psychodynamic Psychology. New York: Humana Press; 2012. Levy KN, Meehan KB, & Yeomans FE. An Update and Overview of the Empirical Evidence for Transference-Focused Psychotherapy and Other Psychotherapies for Borderline Personality Disorder. In R. Levy & S. Ablon (Eds. ), Handbook of Evidence Based Psychodynamic Psychology. New York: Humana Press; 2012. Levy, K. N., Meehan, K. B., Temes, C. M., & Yeomans, F. E. (2012). Attachment theory and research: Implications for psychodynamic psychotherapy. In R. A. Levy, J. S. Ablon, & H. Kächele (Eds.) Psychodynamic psychotherapy research (pp. 139-167). New York, NY: Springer. Levy, K. N., Meehan, K. B., & Yeomans, F. E. (2012). An update and overview of the empirical evidence for transference-focused psychotherapy and other psychotherapies for borderline personality disorder. In R. A. Levy, J. S. Ablon, & H. Kächele (Eds.) Psychodynamic psychotherapy research (pp. 139-167). New York, NY: Springer. Yeomans FE, Diamond D, & Fertuck EA. Borderline personality. In Auchincloss EL & Samberg E. Psychoanalytic Terms and Concepts. New Haven: Yale University Press; 2012. Stern BL, Yeomans FE, Diamond D, & Kernberg OF. Transference-Focused Psychotherapy for Narcissistic Personality Disorder. In, Treating Pathological Narcissism, Ogrodniczuk, J., (Ed.). Washington, DC: American Psychological Association; 2013. Yeomans FE, Clarkin JF, Kernberg OF. "Transference-Focused Psyhotherapy for Borderline Personality Disorder: A Clinical Guide." Washington, DC: American Psychiatric Publishing; 2015. Yeomans FE: Questions Concerning the Randomized Trial of Schema-Focused Therapy vs Transference-Focused Psychotherapy. Letter to the Editor, Archives of General Psychiatry, 64, 609-610, 2007. Audio of Los Angeles radio station KABC weekly roundtable discussion, and Q&A. Barcelona's 5th annual conference: "Narcissism"
Feb. 2016, from Barcelona newspaper. 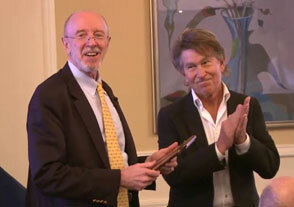 ...upon receiving the group's Distinguished Psychiatrist Award. The title of his lecture is "Transference-Focused Psychotherapy for Borderline Personality Disorder." The Deciding Mind Radio Show hosted by Shelly Menolascino, MD and Mitchell Belgin, MBA interviewed Dr. Frank Yeomans on WGXC, 90.7 FM, June 17, 2012 (30 mB mp3 download, 33 minutes). 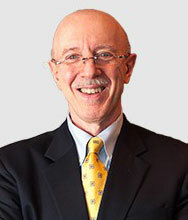 Frank Yeomans, MD, Ph.D., Transference-Focused Therapy (TFP), Dec 11, 2011. Please click here for PDF of the handout.